Fire and fireplace colleagues, welcome to the third and final part of our Warming up for the Heating Season series. In preparation for the busy times ahead, here are our top five stove venting tips that will keep you on the right side of the regulations and your customers! 1. Only use a ventilator with a tested equivalent area. Equivalent area is the safest and most accurate airflow calculation and a requirement of Part J and HETAS Guidelines. 2. Use a purpose made ventilator. A homemade vent using pipe and grilles not independently tested as a set will not comply to regulations (see No1). 3. Remember a stove installed in a house built in 2008 or later will require venting from 1kW. You do not get 5kW of free ventilation in new houses. 4. 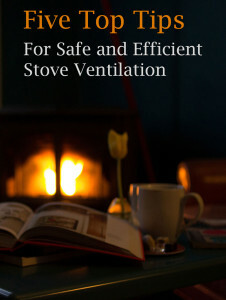 Install a dedicated stove ventilator. A trickle ventilator already present in a window cannot be used to supply air to a stove. 5. Choose from the Rytons LookRyt AirCore range. This range consists of 5” and 3” diameter models all HETAS approved for use with solid fuel appliances. The internal panel is in our anti-draught design which distributes air evenly for a comfortable environment whether or not the stove is in use. Your customers also appreciate being able to paint or wallpaper the panel for an appearance that’s virtually unnoticeable. See our most popular LookRyt stove vents here. Browse our full range in our Boiler, Stove & Fire Ventilators guide. For prices, to order or find a stockist in your area call us on 01536 511874. Order before 3pm for delivery next working day (UK mainland). Warming up for the Heating Season | Part 1. Warming up for the Heating Season | Part 2.